An EnergyStar freezer can make your kitchen more energy efficient. But did you know it can also save you money? It's true! In fact, replacing your old appliances with EnergyStar appliances can save you around $100 every year per appliance in energy costs. On top of that, some appliances may even earn you a tax credit. Which one should you buy? Lucky you, you're spoiled for choice. There are some excellent EnergyStar certified freezers on the market today. The following are some of our favorites. What is the EnergyStar Program? The EnergyStar program started in 1992, as part of the Clean Air Act. It's a voluntary program that encourages manufacturers to specially label appliances that meet specific standards for energy efficiency. As a result, consumers like us can easily identify money-saving, energy efficient appliances when we go to buy them. Since its inception, the program has saved American consumers and businesses some $430 billion in energy costs, while reducing emissions. And it's all from a simple voluntary labeling program. What is an EnergyStar Freezer? An EnergyStar freezer is a freezer that meets the EnergyStar standards for energy efficiency. To be certified as an EnergyStar freezer, a freezer must be 10% more energy efficient than a non-EnergyStar model and must exceed Federal energy efficiency standards. There are two primary qualities you should be looking at when you buy a freezer, and they are size and shape. Buying too large of a freezer is a waste of money, space, and energy. On the other hand, you don't want a freezer that's too small to serve your needs. Next, it's important to consider your unit's footprint. Do you want a chest freezer or an upright? Both have their advantages and disadvantages. Finally, every freezer comes with different safety options, like a door lock (especially important in a household with children) and various alarms. What are your must-have options? Make a list and know before you start your search. If you're buying a dedicated freezer unit, the biggest question is, of course, whether you want a chest unit or an upright. If you're looking for maximum space, a chest freezer has more room than a standing freezer. Those freezers also tend to keep food frozen longer with the power off, so this is a better choice if you live in an area with frequent power outages. On the other hand, upright freezers take up less floor space. They're also easier to clean, search and organize. However, they do tend to be noisier than chest freezers. How much freezer do you need? It's also important to consider just how much storage capacity you need. Do you have a hunter in the family, who needs to store large amounts of meat? Or perhaps you have a large household and want to make sure you have plenty of food on hand. In this case, a large capacity freezer would serve you well. However, if your household is four people or fewer, and you need occasional extra freezer space (my mother used to use our neighbor's chest freezer when the grocery store had its twice-a-year mega ice cream sale), a compact model might be better. It's all about you. A good rule of thumb is that, in most households, each person needs around 1.5 cubic feet of freezer space. That amounts to 35 pounds of food. For a family of four, under most circumstances, a six cubic foot freezer will suffice. Six cubic feet is the size of a mini freezer or many of the freezers that come in a combination refrigerator-freezer unit. Regarding food storage, a quarter of a cow requires five to seven cubic feet of freezer space or a compact freezer. Likewise, you will need at least eight cubic feed for half a cow. If you want to store all of Bessie, However, you will need to use almost the entire capacity of a large-sized chest freezer -- around 16 to 17 cubic feet. First, we visited EnergyStar's residential freezer page, to see which models are covered under the program. Then we consulted trusted review sites like Consumer Reports, to find the EnergyStar freezer models that they liked the best. Finally, we took to the internet to see what actual purchasers thought of their new freezers. As a result, we bring you an impartial, well-rounded list of what we believe to be the best EnergyStar freezers on the market today. Which freezer is ultimately the best? That's for you to decide. But to help you with your decision, here are our picks. Are you looking for somewhere to preserve the spoils of your latest hunting trip? Or perhaps your large household wants to have a large amount of food on hand in case of a family reunion? If this sounds like you, then a large freezer is what you need. 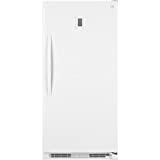 The Kenmore Elite 27002 is Consumer Report's top rated freezer model. They give it a rating of "excellent" for energy efficiency, temperature uniformity, temperature control, and ease of use. Consumer Search likewise considers this model good value for money. Both reviewers and consumers found this model to be noisy. Also, Consumer Search was not impressed by the one-year warranty. Customer reviewers at Consumer Reports were less generous than Amazon reviewers, and rated this model 2.3 out of five, citing power failure performance and noise. There seems to be a split, here, between consumer reviewers and professionals. Unfortunately, there weren't a lot of customer reviews. Consumer Reports tests thoroughly, though, so we'll put this one in the "needs more research" pile. Consumer Reports rated this EnergyStar freezer very highly. In particular, they liked its energy efficiency and its performance on their lab tests. What's more, Consumer Search named it their Best Upright of 2018, calling it simple, reliable, and consistent. Seventy-six percent of buyers who bought this model from Best Buy gave it five stars out of five. Reviewers and consumers alike both found this freezer to be noisy. Critical consumer reviews also cited reliability as an issue. After rigorous testing, The Wirecutter has declared this model to be the best of 2018. Consumers and reviewers both seemed to like this one, despite the noise. It also has a generous capacity. Reviewers consider this model to be very good value for money, as well. Consumer Reports rated this EnergyStar freezer highly for energy efficiency, temperature control, and stability. More than 600 consumers who bought this product from Home Depot rated it an average of 4.7 out of 5 stars. Consumers particularly liked the product quality and rated it good value for money. There were a few consumer complaints about the door seal. In addition, several people found it noisy. Consumers and reviewers seemed to be in sync on this one, also. And it looks like right now, you can get some very good deals on this particular EnergyStar freezer. If the price is right for you, then we think this is a good model. The Wirecutter considers this model to be the best overall freezer of 2018. In particular, they say it offers the storage space of a large freezer for the price of a smaller freezer. And that's important. Its features include a safety lock, adjustable legs, and adjustable shelves. Numerous consumers reported breakdowns within a year of purchase. As far as consumer reviews go, 1,563 of 2,137 people who bought this model from Home Depot gave it five stars out of five. Overall, consumers rated the unit highly for energy efficiency, quality, features, and value. Critical reviews focused on breakdowns. Consumer Reports rated this model "excellent" or "very good" in all categories. Purchaser reviews were few and far between. Those who left reviews, however, praised its power outage performance and general quality. We were unable to find a significant number of either consumer or professional reviews of this model. However, we included it on our list, because both Consumer Reports, which tests products thoroughly and verified purchasers at several outlets rated this EnergyStar freezer very highly. We are optimistic but will be keeping our eyes open for long-term reports. Does your household need a bit of extra freezer space, but not enough to justify buying a large, standalone unit? Consider a compact. There are quite a few good ones out there. Here are a few. Consumer Reports loved this model and rated it "excellent" in most categories. It did get dinged, though, on "ease of use." Verified purchasers are overwhelmingly enthusiastic. Consumer criticisms seemed to focus on issues with the compressor and temperature control. A number of customers were also displeased that the unit doesn't come with a back cover where the power cord is located. They especially liked that it was good value for the money. The Wirecutter considers this one of the best chest freezers out there, regarding price, specs, efficiency, and footprint. On top of that, right now, it looks like you can get some excellent deals on it. We give this model our enthusiastic thumbs up. This chest has a small footprint, but a very decent capacity. Additionally, reviewers and purchasers alike all considered this unit to be very good for its price. Despite what reviewers considered to be a comprehensive warranty, there were numerous consumer complaints about dealing with Maytag service. 1,037 out of 1,455 people who purchased this model from Home Depot gave it five stars out of five. Consumers liked the unit's quality, value, features, and energy efficiency equally well. Complaints seemed to center around difficulty obtaining needed repairs from Maytag, even under a warranty that reviewers praised. The Spruce liked this unit's energy efficiency measures, including extra insulation. They also liked the fact that it uses an environmentally friendly refrigerant called R600a. Also, they loved the adjustable temperature controls. 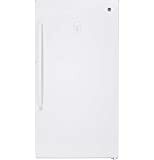 Consumer Reports praises the energy efficiency of this EnergyStar freezer, although it does take points off for ease of use. Sixty-five percent of more than 400 Amazon purchasers, awarded this model 5 out of 5 stars. They were impressed by the unit's quality, as well as its storage capacity. If you're looking for a compact, this might be one to keep your eye on. If you're looking for a large-capacity freezer, then it's pretty hard to go wrong with the GE FUF17DLRWW. Why? Well, both consumers and reviewers seemed to like it a lot. In addition, the problems that consumers reported seemed minor by comparison. Finally, it looks like if this is the machine for you, you can get a great deal on it right now. As far as compacts go, we're with the GE FCM11PHWW -- again, because of the enthusiastic reviews from both customers and professionals. So, which EnergyStar freezer is for you? And have we missed out on any great models? Let us know in the comments!